Major Joseph Delafield, president of the New York Lyceum of Natural History, purchased 257 acres in what was then still Westchester County in 1829. Today, the area is in the section of the Bronx known as Riverdale. 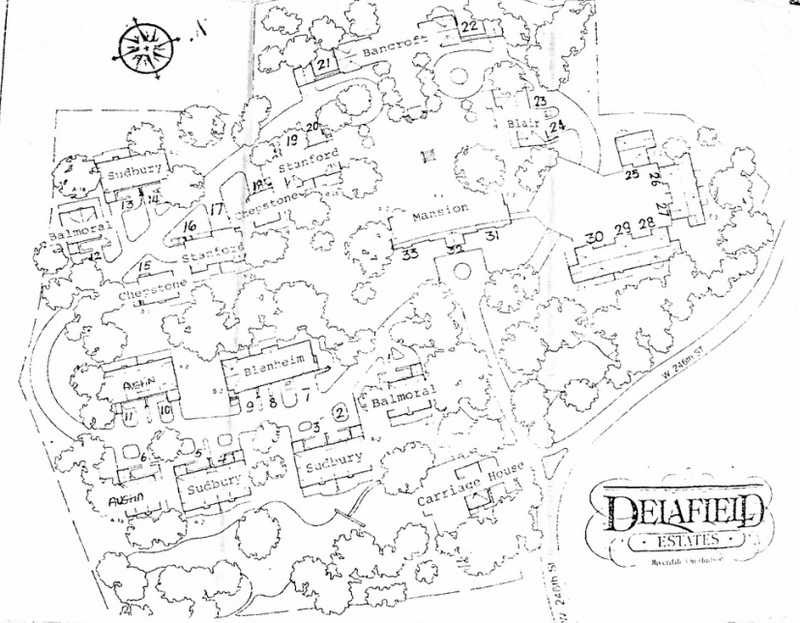 Delafield purchased the land as a country retreat where he could bring parties to hunt wild boar. The hunting lodge originally on the property survives to this day. The property extended from Broadway to the Hudson River, with a manor house built in 1865. Rising costs, however, caused the Delafields to begin to search out other uses for the property. Beginning in 1882, members of the Delafield family began to map out streets on the eastern part of their estate These streets were curved and attempted to maintain the rural feel of the area, and would later be at odds with the grid system that moved up from Manhattan into the rest of the Bronx. They began to sell plots based on this street grid in 1910, and in 1912 the area was officially named "Fieldston, Riverdale-on-Hudson," rumored to be named after the Delafield family estate in Ireland. As it became increasingly more expensive to maintain large estates, many landowners in the Bronx, beginning in the 1920s, began to follow the Delafield model and create small developments on parts of their land. Oftentimes the estate mansions were either retained by the family, or turned into multiple family dwellings, while the facade remained intact. Over the years, the rest of the Delafield estate was portioned off in the manner, until only 10 acres remained. 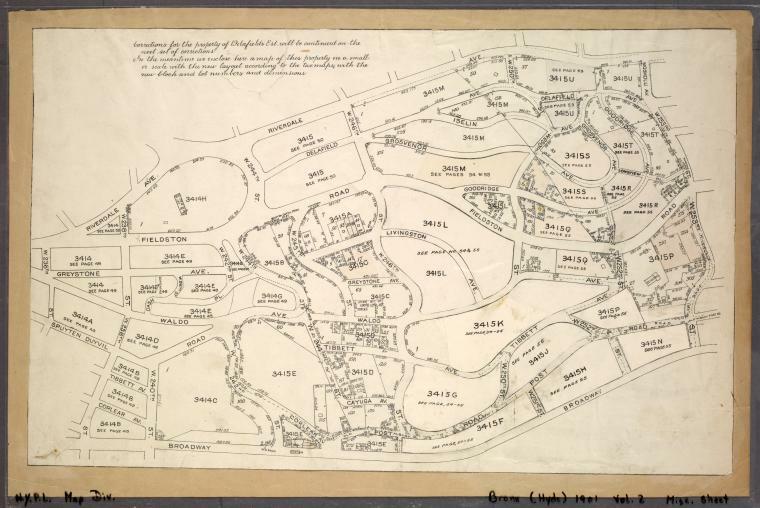 In 1965, Edward Delafield donated these remaining acres to Columbia University. Development was proposed on the land many times after the donation, but due to the increased awareness about preserving undeveloped land made it hard for development plans to succeed. 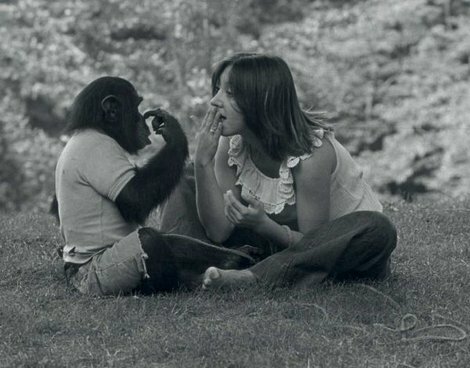 At one point the property was even used by Columbia University Grad Students to raise a Chimpanzee named Nim as if he were a "Human Child." Finally, in 1984, a British architecture firm put a successful plan through, mainly because they left much of the original topography of the estate intact, and designed the homes around the model of the already existing homes in the area. The plan called for 33 houses, both attached and free-standing, to be built on the former estate land, with the still-standing Delafield mansion, at the end of 246th Street, converted into three connected homes. Promotional material at the time bragged about an "ultra-exclusive residential enclave'' of homes that ranged in price from about $660,000 to more than $1 million. 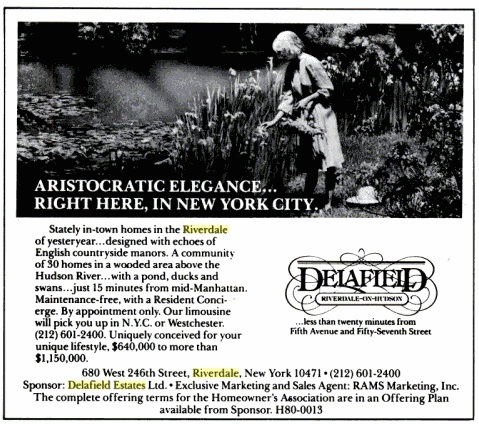 The development was even given a name to attract potential residents: ''Delafield, Riverdale-on-Hudson.'' 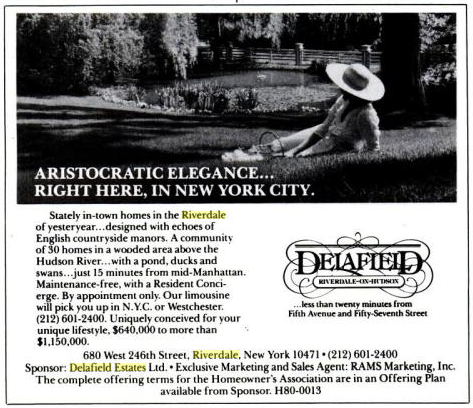 The Delafield homes were built on the model of English manor-style residences, All of the streets and common areas in the development were to be owned by the community corporation, something that is not seen often in New York.